The top 20 pizzas in NYC, according to us. The best late night restaurants in NYC. A few months ago, we found ourselves walking through Little Italy, when we were stopped by a man and his son. With a sign for WORLD’S BEST CANNOLI framing his head, he asked, “Do you know where we can get some good pizza?” At an outdoor table to his left, an all-blonde family looked at their plates of spaghetti with an air of disappointment. Cue the sad music. As a first step, this man and his son were going to have to get out of Little Italy. Aside from a mini FUGHEDDABOUTIT license plate keychain, there is not much in Little Italy proper worth your time these days. We knew we’d have to send him a few blocks north. So, where to? Without further guidance, they might have ended up at Lombardi’s, the city’s “oldest” pizzeria, but frankly, the pizza there is kind of gross. We could have sent them to Rubirosa, where the pizza is incredible, but they would have waited an hour for a table. We could have sent them to Pomodoro on Spring and Mulberry, a place that is allegedly known for a great vodka slice but in our experience is best known for people too drunk to realize their pizza is bad. But this man and his son deserved the real deal - they needed to go to Prince Street Pizza. 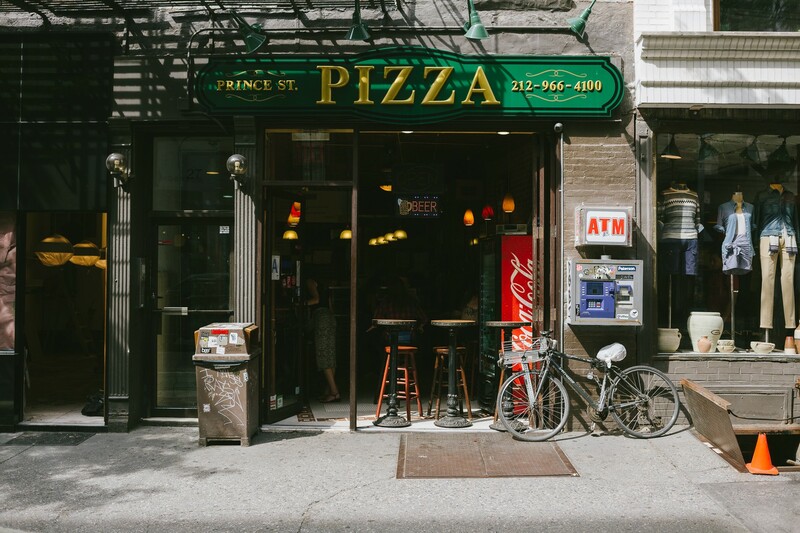 The moral of that story is a simple one: if you’re in Soho/Noho/Nolita, and you need a classic slice joint, head to Prince Street Pizza. The location actually housed the very first OG Ray’s up until a few years back, but the newer Prince Street is much better, while still retaining that classic NYC pizza place charm (the cashier was talking about Frank Sinatra on our most recent visit, and pictures of B+ celebrities are on the wall. What more do you want in life?). Are the regular cheese slices as good as Joe’s? Definitely not, but that’s not what you should order anyway. Get a spicy square slice (extra crispy), put on your I <3 NY shirt, and remember why you love this city. The order at Prince Street Pizza. It’s a square slice with slightly spicy sauce and little pieces of pepperoni that crisp up in the oven. We don’t even like pepperoni, and this is amazing. They’ll gladly cook it extra crispy - you want that. Passable, but a slightly disappointing plain slice. The thin crust of the round pies works better with the lighter margherita option. If a square isn’t your thing, the margherita slice is excellent - it’s basically the cheese slice, but with fresh mozzarella. Tacombi has an awesome Mexican courtyard, and gets serious points for creativity. All in all, we back the place, especially now that they have a liquor license. A simple Italian cafe that works in tons of situations, Epistrophy is one of our Nolita go-tos. A seafood restaurant from the people behind The Meatball Shop, Seamore’s is healthy, reasonably priced, and a good time. No wonder it’s always packed. This old school red sauce Southern Italian trattoria has been an UWS neighborhood staple for years. The food is definitely good and very well priced for the area, but the real reason you’re coming to Celeste is to spend some quality time with the owner. Lido is a neighborhood Italian spot in Harlem that also does a serious bottomless brunch. PizzArte is not just another pizza joint. It also happens to be an art gallery. That must have sounded awesome in the business plan. Pizza in a sterile Flatiron District hotel lobby just doesn’t feel like the Danny Meyer hospitality experience we’ve grown accustomed to. Razza is a wood-fired pizza spot in Jersey City that’s well worth a trip from New York. Or from anywhere else. Mama’s Too is a tiny pizza place on the Upper West Side, and it’s where you’ll find some of the best slices in the area. Get the square pepperoni one. Violet is an Italian restaurant in the East Village that specializes in really thin flatbread pizza. A legendary Staten Island pizza place has opened in Greenwich Village, and the pies are as good as they have been for 100 years. Get the clam pizza.